It was one of those nice nights when everything went perfectly well. I had a prearranged interview with founding member Trevor Phipps, so I arrived early. Really early. I texted Trevor, told him I was at the bar eating pizza facing the stage and I was available at his convenience. We made arrangements to do the interview after soundcheck; about an hour away. I was lucky enough to witness the soundcheck and was super surprised when Trevor walked over and said, “Hey, are you Susie?” and shook my hand. He followed up with, “Is the pizza any good?” I responded affirmatively. He grabbed a slice and asked if he could join me. It was nice to chat and eat prior to the interview. That time before the interview really sets up the tone of the interview. I found Trevor to be really down to earth and easy to talk to. After we ate, we headed downstairs to the green room and did a stellar interview…in the laundry room, with the washer and dryer going. The audio has a constant hum of the dryer and some other impromptu noises, but it’s still really good. Gone are the days of the 80s, where a wife and kid(s) are secrets, he lavishly talked about his awesome wife and all of the support she gives him, and missing his kids. I asked if his kids were aware of how cool their dad was, and he replied. “No, my son is only 11 months,” and we had a good laugh. 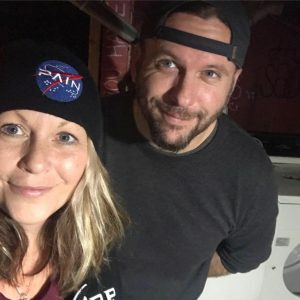 We talked about his influences, first concerts, what it was like to have a member of Killswitch Engage review his album, touring in the early days versus now with a family, and what he believes the positive benefit of streaming music is.